Preparation for this activity was really simple. First you get a few empty bowls or containers, and fill them each with a bit of bubble blowing liquid (or baby wash). Then you put a bit of food colouring in each bowl. I used the primary colours red, yellow and blue, and later on I mixed them up a little and got secondary colours. 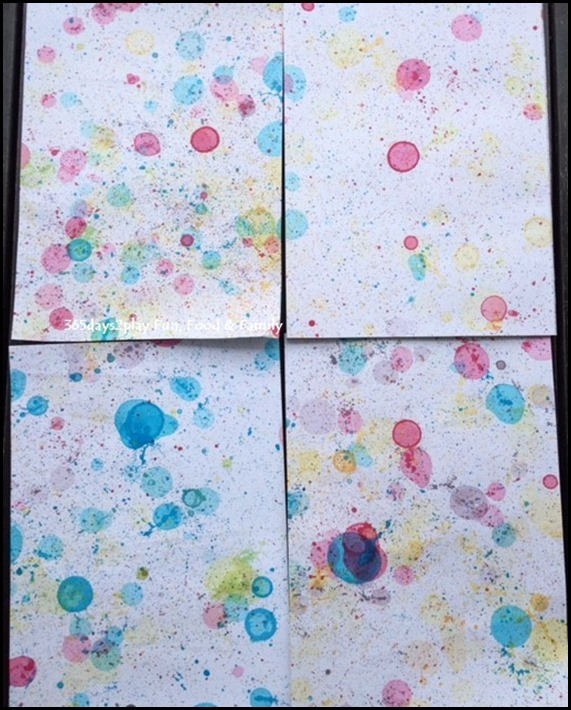 Then you lay out some paper on the ground, or even standing up, because the bubbles go everywhere! You can experiment with different coloured paper for a different look! You know when they say children learn best through play, it’s really true because I learnt so much out of this activity too! 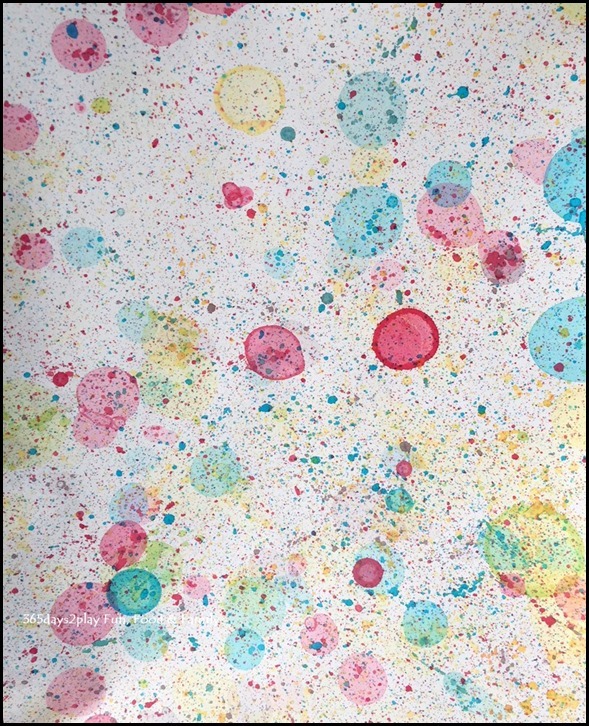 I didn’t realise that blowing bubbles causes so many tiny splatters, from the blowing action, and when the bubbles pop. And do you notice that some of the bubbles have a beautiful thick ring around them? That’s because those bubbles didn’t pop immediately upon landing on the paper. Only the bubbles with enough liquid in them can hold on for a while while the really thin ones pop upon landing. It was a bit of a feat to get the bubbles not to pop so soon. Maybe next time I need to use more bubble liquid, mine was a little too thin. We did this on a slightly windy day! The bubbles were going everywhere and not landing on the paper! We had to keep shifting around, experimenting with paper on the ground, and paper held up vertically. If possible, do this on a non-windy day if you don’t want such a challenge! But then again, it can be fun to get the kids to run around with paper, trying to catch the runaway bubbles! 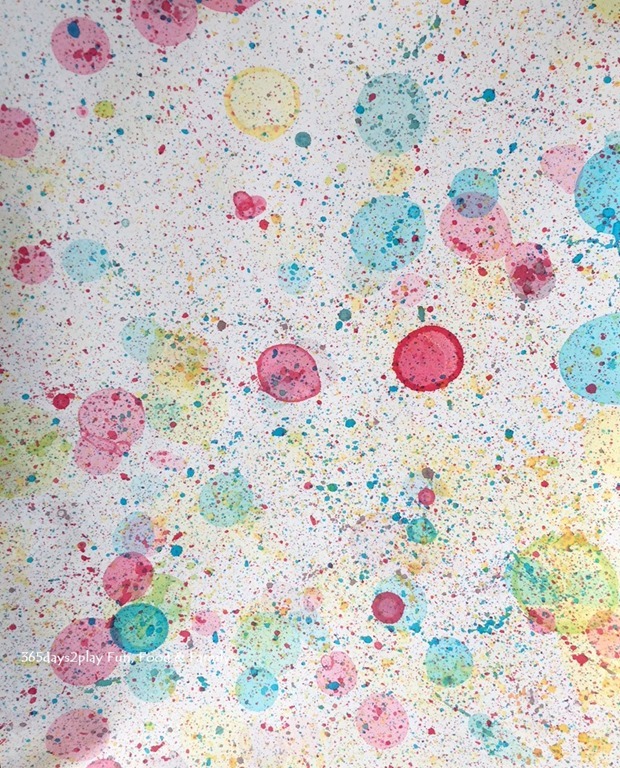 The paper can’t be too close to you either, or you’ll end up with more splatters than bubbles. Of course that’s okay too if you don’t mind the splatters, which kinda makes it look galaxy-ish. Speaking of galaxy, I might try this on black paper the next time, to make it look like a night sky! Or if I can get my hands on some luminous paint, that might be a good idea too! Prepare numerous pieces of paper so that you can catch more of the bubbles! So many learning points just for 1 activity! And so many possibilities to customise and take the activity further. Try it! Oh a word of warning though, if you use food dyes (as opposed to washable water colours), it will stain. So definitely don’t try this indoors unless you are prepared to wipe down all the surfaces, or have them covered. 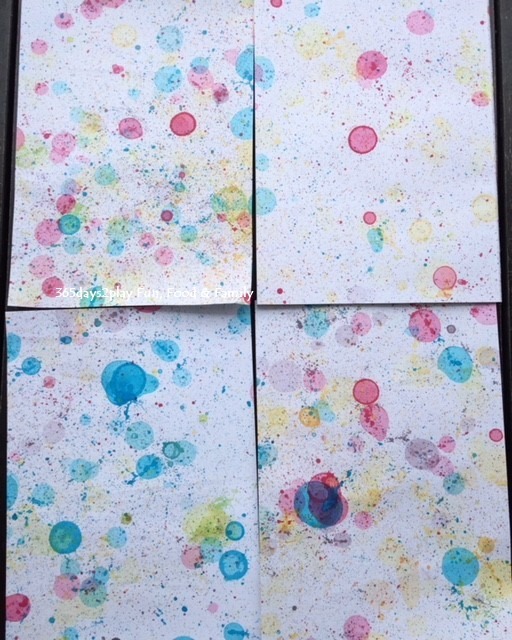 You can also create a new activity out of these coloured bubbles paper by turning them into cards, and perhaps even mailing a nice one to the Grandparents? For more pictures, check out Edward’s Instagram!